eddiesallaboutfood | My journey with food, from growing to eating, bee's to poultry,grain to bread,farm shops in the UK and Canada, from recipes to eating, and a good few restaurants, it's all about food. My journey with food, from growing to eating, bee's to poultry,grain to bread,farm shops in the UK and Canada, from recipes to eating, and a good few restaurants, it's all about food. I just love farm shops. It might be the fact that 40 years ago I worked at Westland’s Farm produce in Surrey. It sold the meat we produced on the farm and from other local farms, and it was always busy catering to the (then) new trend of stocking your freezers with bulk meat straight from the farm. In pursuit of this passion, I have covered hundreds of miles visiting farm shops in the UK, and farm markets in Canada. One day shortly after I retired, my wife Barb and I traveled from Derbyshire to Essex (approximately 3 hour drive) to visit a farm shop we had heard about. We then spotted and stopped at six more as we made our way back home. Every shop was different: some were small, just selling what was reared or grown on their own farms; there were also much bigger affairs with meat and produce from their own and many other local farms. The word here is local… not grown the other side of the country or even the world, not sent though many middlemen before it gets to the shops days or weeks later, but grown on the farm or a few miles away, treated with love and care and sold direct to the customer. At my Canadian home in Meaford, Ontario we are in the middle of the Apple growing region. At Grandma Lamb’s farm shop we can buy apples and delicious made-on-site pies, using apples grown right behind our property–now that’s local for you! 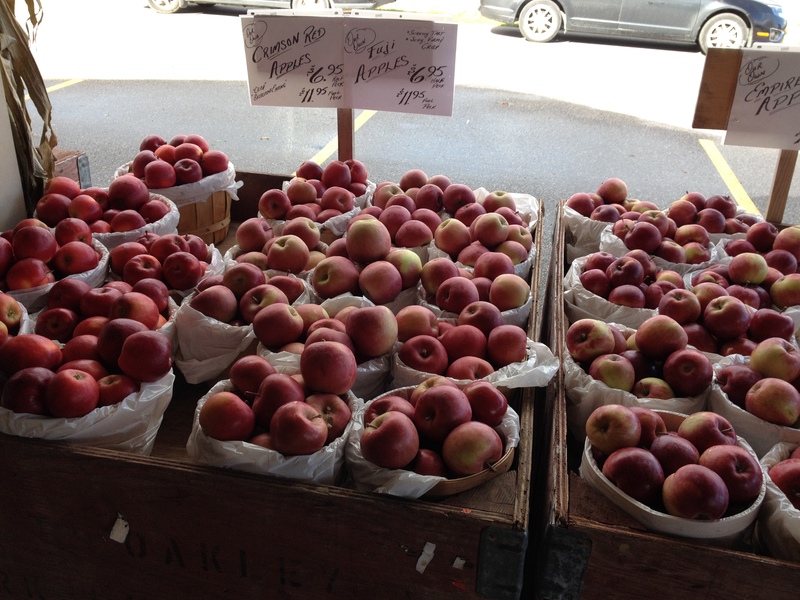 Farm shops respect seasonality, choosing to sell their own produce when in season. Asparagus in the spring…straight from the soil…eaten that day…bliss! Fresh-picked strawberries warm from the summer sun, not brought in from far-flung countries. How many of us have tried those nice looking red strawberries in the big stores out of season? Invariably we find them hard and tasteless thanks to so many food miles behind them. Over the next posts, I will profile one of my favourite farm shops on 2 continents and, of course, the dishes I created after I went shopping! Great farm shops deserve our recognition and support. Share your favorites in the comments section. Looking out of the window on a beautiful Thanksgiving Sunday, towards the Blue Mountains and across the Beaver Valley with the autumn leaves all red, gold and bright yellow, it was a wonderful sight to see. 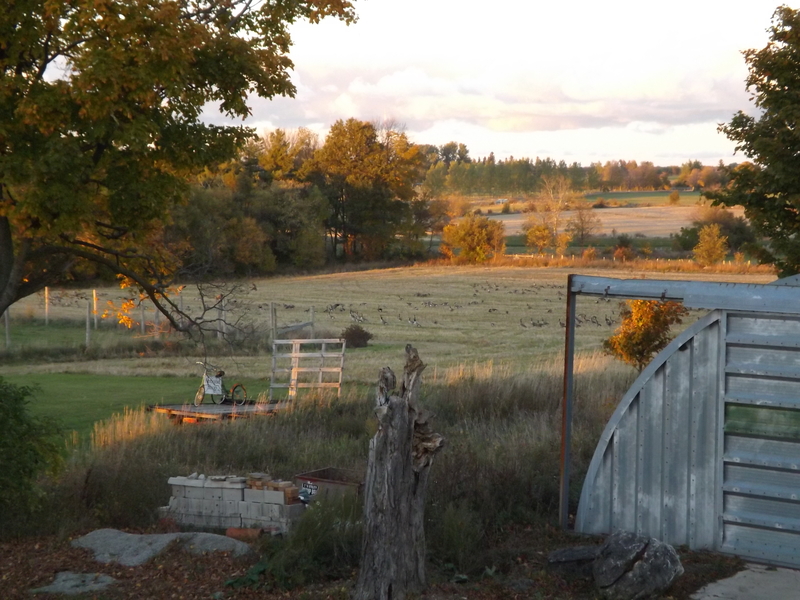 Then looking down into our field it seemed to be moving, the whole field was alive with geese gorging themselves on the grain left on the ground after the harvest. So many geese in fact that cars were pulling up on the road to look and take pictures. As a Brit it was a sight to behold and one I’m sure I will always remember. Of course the geese were naturally filling up their fuel reserves before the long flight down south. It made me remember a chapter in the book I am reading at the moment by Dan Barber called The Third Plate. Dan is executive chef and co owner of Blue hill and Blue hill at stone barns a working four seasons farm and education center outside of New York. This is a must read book for everyone who loves food, and is interested in the future of food production in North America. In this chapter Dan talks about a trip he made to a region of western Spain, to visit a man named Eduardo Sousa who produces foie gras without force feeding his geese. 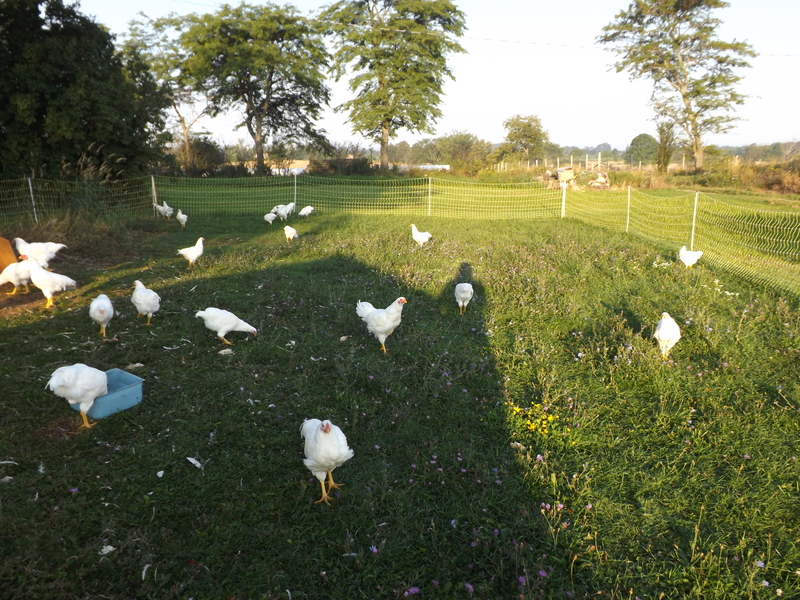 Eduardo lets his geese gorge on the acorns, figs, olives, lupin plants and grass and the birds move about the farm free range to eat what is, at it’s best, just like the geese in our field. Foie gras is one of the treats of the gastronomic world I have yet to sample. Many years ago I watched a documentary on British television, about french farming traditions, and there on a stool sat an elderly woman in a head scarf pushing what looked like an over sized metal funnel down the throat of a goose which was followed by scoop after scoop of wet looking corn,. Now this was not a film from an animal welfare group keen to show how cruel this type of animal husbandry is and why we should not eat such food, but just a film about rural living as it was in France at the time. However, it has put me off wanting to try foie gras in the years that have followed, not that I have not been temped when I have seen it on the menus or in shops during my many trips to France. It has been described to me as buttery, delicate and rich; something you must try, making your mouth water at the very thought of it and should be on any food lovers bucket-list. The technique of using gavage or force feeding ducks and geese dates back as far as 2500 BC to ancient Egypt, but it is France that produces and consumes the largest amount, followed by other European states, United States and then Canada which comes in at about 10% of world production, and catching up fast is China. The basis for foie gras production is based on the migratory birds capacity to put on large amounts of weight particularly in the liver before the long flights south. In France ducks and geese are traditional used, but here most commonly used, is the cross between a male Muscovy duck and a female Pekin duck called a Mulard (Moulard). Production of foie gras can continue all year round using the gavage method of force feeding, however, with the method that Eduardo uses, he can only harvest his livers in the Fall to coincide with the winter migration, as soon as it starts to get colder and the nights draw in the geese start to fatten on all that autumnal goodness. With many cities, states and countries now banning the production and sale of foie gras, is there not a case for a seasonal foie gras that is humanely produced by small farms in a natural way as Eduardo does in Spain? I know this is not Spain and the conditions are different, but I believe that our farmers are an inventive bunch, and I am going give it a try myself next year (so watch this space). I don’t think for a moment that the foie gras produced by natural means will be a patch on the product produced in the traditional way, the ones that grace the tables of fine dining establishments, it won’t be as yellow or have it’s size, but it could be a credible alternative, one which would only be available once a year for a short period of time, something to look forward to and celebrate. Similar to the way we use to look forward to the short strawberry season when I was a child. The rest of the bird could then be used for meat with it’s rich flavor, cut with cherries. What a treat! If not, I’m going to have to try the traditional foie gras if only for one time, and source it direct from a good farm that does its best to produce livers and duck meat with welfare of its birds at the very heart of its operation. I know that there are many such farms here in Canada and the USA. The trouble is for every good farm here, there are very many that let the side down around the world and these farms need to get their act together and stop the bad practices and cruel confinement that the birds suffer during the last days before slaughter. Some of you may call me a hypocrite, and I can see why that might be said there is good and bad treatment across all areas of farming, not just this one small section of the poultry industry, and as I come across these I will pontificate about them as well. I am a meat eater, owned a butchers shop and sold nearly every type of meat product there is. Very little of that has not passed my lips as I have kept turkeys, ducks, chickens, pigs and dairy goats in my time. My father who kept chickens and rabbits in our back yard in the UK, gave me some sound words of advice when I helped him, Always give the birds the best life and the best death possible and you will be rewarded the best meat you will ever taste. I have always followed that advice sourcing the meat for the shops as much as possible direct from farms so I could see them grow and finish in conditions that would give them a good life and then they were taken to a local abattoir to be slaughtered and I was there as often as I could to see they had a good death. I and my customers were rarely disappointed in the results. When I woke up and saw the geese last Sunday, I did not know what would jump into my brain. I had another post in mind altogether, but I’m glad I saw the birds and able to post what was on my mind. 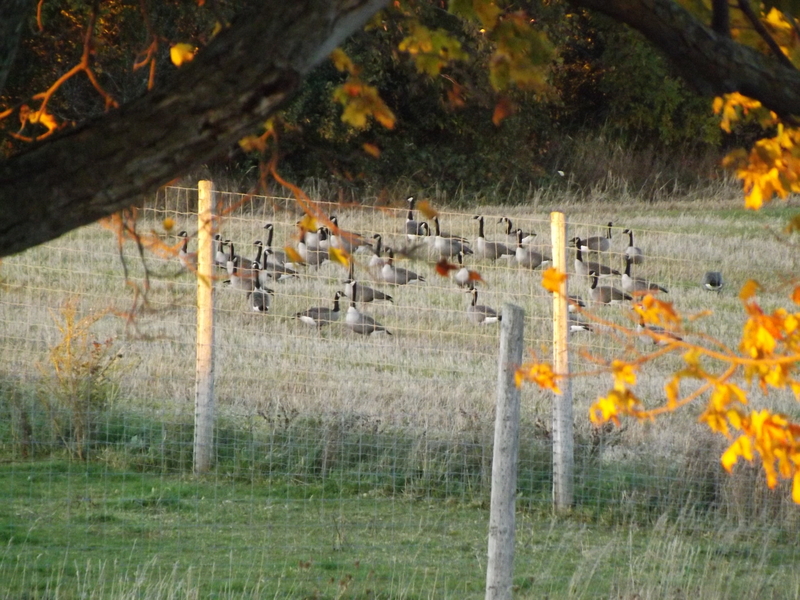 Most of the geese have gone now and the autumn leaves are falling from the trees around the farm, winter will soon be with us which means it is my time for reading cookery books, baking, writing the blog and sitting by a big fire with a large glass of something red. Pictures: top picture is Chantecler chickens free ranging at our farm, lower picture is apples fresh from the orchards in Thornbury Ontario. The journey I’m about to make starts with my love of food. As this is my very first post on my blog I think I should tell you a little about myself. My name is Eddie and I live in Derbyshire England, and in Meaford Ontario Canada with my wife Barbara, we do have the best of both worlds. I took early retirement from my job as a quality control manager for the co-operative group, for those who don’t know the Co-op as we know it, it is the 5th largest supermarket chain in the United Kingdom, with 8 regional distribution centers, of which I managed 2 and with a team of QC officers we oversaw all the fresh food going through to stores, freshness, quality, health and safety, and meeting strict specification’s, this included meat, produce, flowers, dairy products, eggs etc, so a wide range of fresh foods I was like a kid in a toy shop every day it was the best job in the world for a foodie. Derbyshire is situated in the middle of the country, the very center of which is dominated by the Peak District Park, and the wonderful stately home Chatsworth, home of the Dukes of Devonshire, which has one of the best farm shops in the country, the house and farm shop are a must visit if you visit the UK, but more of that later. 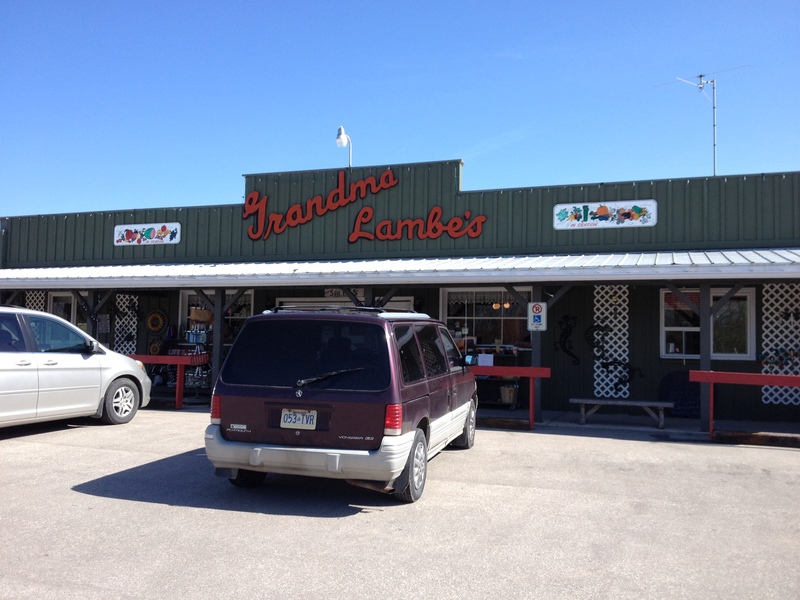 I will endeavor in the course of my blogs to review some of the best farm shops everywhere we travel, and provide links for those other foodies who would like to visit them. Meaford Ontario, is another wonderful place to visit, this region of the south Georgian bay (part of lake Heron) is surrounded by apples orchards, growing wonderful apples and pears, to be able to visit the orchards and buy the freshest and crispest apples straight from the growers, and pick up an apple or a fruit pie from places like Grandma Lambs Orchard and farm shop to the east of the town of Meaford is a joy to behold. Further east on the west side of Thornbury lies another orchard and farm store, Goldsmiths, which sells their own grown apples and other locally grown fruit and vegetables which are outstanding and with Thanksgiving this weekend it was packed with shoppers, we brought Kawartha Dairy ice cream, one of the best ice creams I have eaten. The climate here is perfect for growing a variety of fruit which includes wine grapes, and we have two vineyards within a few miles of the town Coffin Ridge winery and Georgian hills winery, more about them later. I know what you are thinking, this sounds more like a travelogue type blog than a food blog, but to see where I live and what surround’s me here in Canada, and in the UK is to know me and what makes me tick. I wantt you to know how I love to bake, to BBQ, to feed friends and family, my journey will take me many places from farms to restaurants, from my back yard garden with my home grown vegetables my ducks and heritage Chantecler chickens to farm shops across the world, and it will all be yours to read and comment on! !